alaTest has collected and analyzed 68 reviews of Sony Handycam DCR-DVD300. The average rating for this product is 3.8/5, compared to an average rating of 4.0/5 for other Camcorders for all reviews. Reviewers are impressed by the connectivity and image quality. The durability and size are also appreciated. The memory and battery get less positive comments. There are some mixed views about the zoom. We analyzed user and expert ratings, product age and more factors. 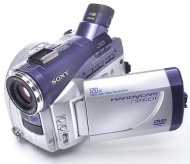 Compared to other Camcorders the Sony Handycam DCR-DVD300 is awarded an overall alaScore™ of 74/100 = Good quality. alaTest has collected and analyzed 54 user reviews of Sony Handycam DCR-DVD300 from Amazon.com. The average user rating for this product is 3.8/5, compared to an average user rating of 3.9/5 for other Camcorders on Amazon.com. Reviewers really like the connectivity and image quality. The size and usability also get good reviews. Many are critical about the memory and durability, and there are mixed opinions on the zoom and portability. This camcorder records to DVD, but don't throw out the videotape quite yet: That feature is a little awkward to use. Although this camcorder's ability to shoot straight to DVD sounds attractive, the process is awkward. If you don't mind its slightly bulky profile and mediocre still images, the DVD-300 is a good choice. If you don't mind its slightly bulky profile and mediocre still images, the DCR-DVD300 is a good choice. It produces solid images across the supported range of resolutions, and its DVD format is very convenient for most users. A strong entry for Sony in the brand-new DVD camcorder marketplace. Wonderful for recording life's special moments! Nice, durable camera that records on mini DVD's. 3.5"LCD Screen rotates over 180 degrees. Bulky, slow to get started and it takes a long time to eject discs. Sony DCR-DVD300 DVD Camcorder - Wonderful for recording life's special moments! Great for recording special moments in life! sony is the conservative leader,means long work at drawing board.